A George III period well-figured mahogany revolving drum table, ebony strung throughout, having green tooled leather circular top above frieze drawers supported on turned stem with reeded 4-splay legs ending on original brass castors. A pair of George III period mahogany stools, having drop-in seats with boxwood and ebony strung frames supported on ring-turned tapering legs. 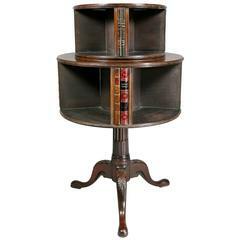 Two-tier with each section revolving, leather book spines alternating with shelving. 19th century English George III pembroke table. Rectangular hinged top with lower pull out drawer, raised on square legs.